We need your love and support! Vote for @steemitbloggers! Hello to all the people who are reading this right now. It's official guys. 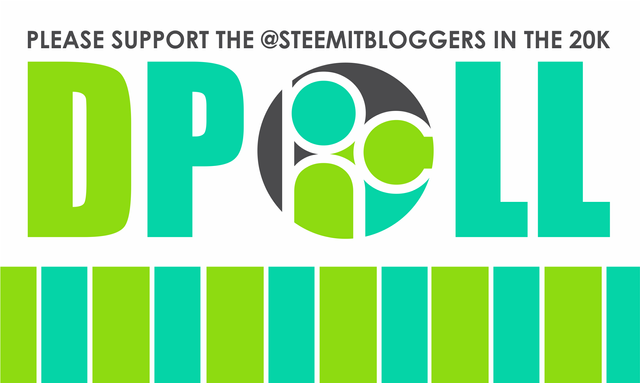 The @theycallmedan 20k Delegation Dpoll is live so I am writing this to ask your support for our Family called Power House Creatives formerly known as @steemitbloggers. One thing that I love from this family is all the support they have given me these past months since joining them. So if you're reading this right now I am asking you guys to vote for our community, the details are below. Congratulations! This post has been upvoted from the communal account, @minnowsupport, by sgbonus from the Minnow Support Project. It's a witness project run by aggroed, ausbitbank, teamsteem, someguy123, neoxian, followbtcnews, and netuoso. The goal is to help Steemit grow by supporting Minnows. Please find us at the Peace, Abundance, and Liberty Network (PALnet) Discord Channel. It's a completely public and open space to all members of the Steemit community who voluntarily choose to be there. Your UA account score is currently 1.757 which ranks you at #31454 across all Steem accounts. In our last Algorithmic Curation Round, consisting of 220 contributions, your post is ranked at #93.